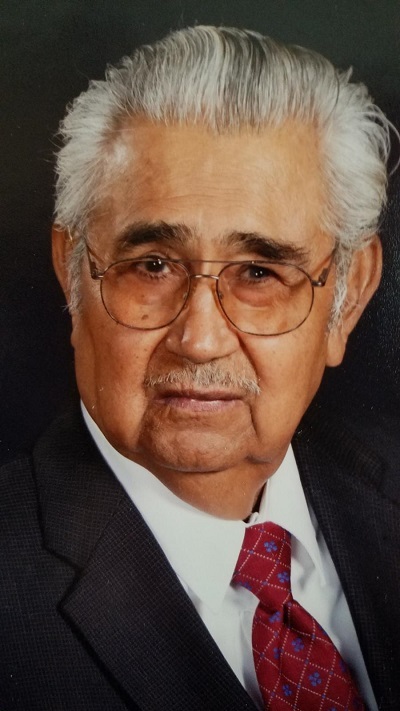 Eutimio H. Vasquez of Whitewater Wisconsin passed peacefully surrounded by family on February 3rd, 2019. Eutimio was born in Laredo, Texas on March 17th 1934 and moved to Whitewater with his wife and his mother 60 years ago. He worked for the Whitewater Foundry for many years, eventually retiring from Hawthorn Mellody in 1994. He raised a family in Whitewater with hopes of living the American dream so his children could get a good education and achieve all the things he wished he could have as a young man. Eutimio loved watching the Milwaukee Brewers, Green Bay Packers, and watching the news and reading the paper. He adored his grandkids and was a great animal lover. Tim, as his friends called him, was a Korean War Veteran and enjoyed volunteering with the local VFW. He wore his Veterans hat and VFW coat with great pride. He is survived by his wife of 60 years Herminia R. Vasquez, sister, Rita Villareal (Hector Villareal), son Jose E. Vasquez, (Elizabeth Vasquez), daughter Yolanda Hollenbeck (Dan Hollenbeck), son Arturo A.Vasquez (Lina M. Garcia Vasquez), daughter Gloria E.Vasquez-Leemkuil (Mike Leemkuil), grandchildren: Vanessa and Alessandra Hollenbeck & Gabriela, Sebastian and Gianna Vasquez. He was preceded in death by his father, Jose M. Vasquez, mother, Luisa H.Vasquez and sisters, Josephine Alvarado and Angelina Botello. Eutimio was a loving husband, father, grandfather, uncle and friend to anyone he met. He was known as a great inspiration to younger generations of Hispanic Americans who searched to build and achieve the American dream with honor, respect, and dignity. Thank you to Agrace Hospice from Janesville as well as Saran Batchuulun, John Hethorn and their daughter’s and all the wonderful caretakers who stayed with our father so he could live the remainder of his life alongside his wife. Visitation will be at Nitardy Funeral Home in Whitewater on Friday, February 8, 2019 from 6pm-8pm. The viewing will be at St.Patrick’s Church from 11 am-12 pm on Saturday, Feb. 9 before the funeral service which will begin at noon. Eutimio will be laid to rest following the funeral service at Hillside Cemetery in Whitewater. Nitardy is assisting the family with arrangements.